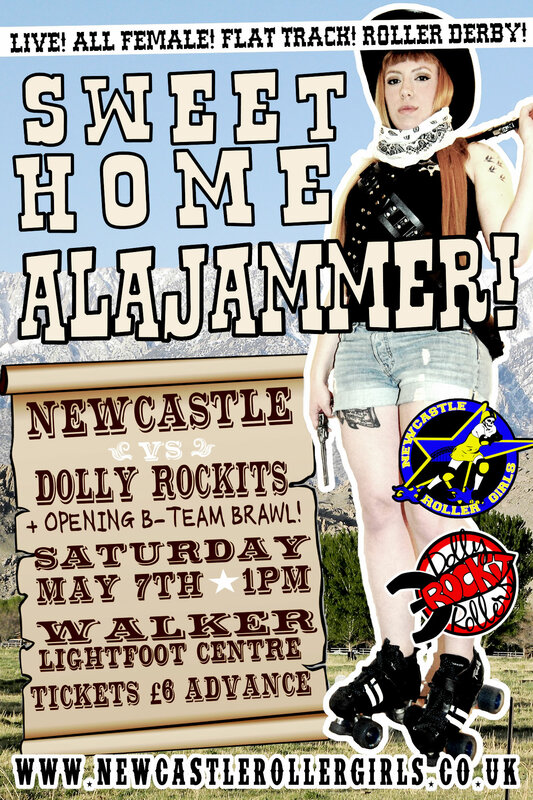 Newcastle Roller Girls are pleased to announce their next home bout, Sweet Home Alajammer will take place on Saturday 7th May at a sweet lil’ ranch named The Lightfoot Centre in Walker. The rootin’ tootin’ Newcastle lassies will be taking on those Dolly Rockit city-slickers from Leicester, for a grudge match back on Geordie soil. Roll up at 1pm, the opening brawl will begin at 1.30, with the main shoot out at 2.30. Then join us to wet your whistle and hang up your spurs at our hoedown at Mr Lynch from 5pm! So mount up, cos ready or not, we’re gonna skate. Tickets £6, under 12s are FREE in, and all under 16s MUST be accompanied by an adult.